Fishing can be boring if you don’t happen to carry a finder with it. Yet, on the top of that, a finder with all those advanced features are also quite hard to find. So if you are looking for a clear scanning down imaging fishfinder combo, the 53dv can be your solution. 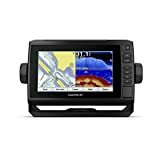 Not only these features are the reason that you will be depending on to buy this stuff, there are more features that we thought to highlight with this Garmin echomap 53dv review. To add more, the good news is that the echoMAP CHIRP series of the brand are quite becoming popular as you will find it easy to operate. So it’s actually chance-grabbing news, especially for the beginners. We hope that this garmin echomap 53dv review will help you in your decision. 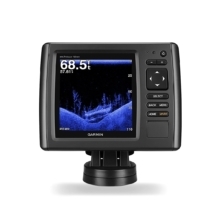 Garmin DownVü scanning sonar gifts you nearly a photographic image down to 750 feet deep. So you can clearly see all the activities of everything, be it structures, submerged objects and fish! Moreover, it uses a 2.5-degree thin beam in fore to aft, but is much wider from side to side, with an angle of 53 degree.However, the brand has combined the DownVü scanning sonar and Garmin HD-ID sonar into one transducer so it’s like a 2 in 1 sonar game. Furthermore, the 2D sonar uses 2 beams having a conical shape for each of the frequencies. The sonar beam for the 200 kHz has an angle of 15 degree which you will find more focused and best for shallow waters while the 77 kHz beam is great for medium depths with an angle of 15 degree. Besides, you will also get Minn Kota and Motor Guide trolling motors that the HD-ID sonar will support with integrated transducers. Additionally, it also comes with a sonar-recording capability that manages the timing of the sonar return with the position of your boat and stores digital information so you can playback. So all you have to do is, use the User Data Sharing Cable so you can share routes and waypoints between multiple devices. The device also features maps including 17,000+ U.S. rivers, lakes, and reservoirs. The LakeVü HD show you an excellent detail of underwater features with Safety Shading that helps you designate a minimum depth. Moreover, the Quickdraw Contours is another software feature that you will find it already installed on your Garmin device. It helps to create your very own personalized HD fishing maps instantly with 1-foot contours. However, whenever you are off the water, you can keep your echoMAP safely. It’s that much easy thing to do. You don’t even need to mess with plugging and unplugging wires from the device as the cords plug directly to the mount. So you can install quickly and remove your echoMAP from power and the mount. Its 5 Hz GPS/GLONASS enables to refresh your position and heading 5 times each second so that it can get your movement more fluid on the screen. Which means, It makes dropping up to 5,000 precise waypoints and getting your way back to your hot spots quick and easy. Fish Symbol ID is another sonar function that helps in attributing fish icons to the sonar returns which are interpreted as fish. In short, it will show the fish instead of fish arches. Besides, A-Scope and Bottom Lock are two other sonar functions that you would like to use a lot. While the Bottom Lock keeps track of the bottom via showing it flattened regardless what the shape it is, There is another A-Scope feature which is a vertical flasher view that indicates the most recent sonar echo.Not only that, there are other 2 important features that this device provides: sonar recording and sonar rewind. You will also find a zoom-in just like the other echoMAP series units. A-Scope and Bottom Lock helps you notifying about the recent sonar echo and the bottom. You will find zoom in feature so you can see the fish in a larger view. You can refresh your position and heading 5 times each second. The scanning sonar offers photographic image down to 750 feet deep. You can form your very own personalized HD fishing maps instantly. The lack of NMEA 2000 connectors might be an inconvenience. You might not find any information regarding how much internal storage this device has. You might not find the chart accurate so you would want to upgrade the chart card. Q: What is the difference between the 53dv and the 73dv? A: The one with 53dv has a 5 inch screen and 73dv is a 7 inch screen. Q: Does it display speed? A: Yes, the unit displays speed. Q: Will this unit take other micro-cards other than Garmin? A: You can use a SanDisk 32GB micro SD. Q: Does this unit require an external antenna? A: No, it works well without any external antenna. Q: Does this unit get you back to the launch that you started at? A: Yes. It features a Series of chart-plotter or sonar combos and the preloaded LakeVü cartography. All you have to do is, put in your starting coordinates and destination coordinates simply and they will pop up on your screen. Afterwards follow it reversely when it gets time to go back home. Q: What kind of transducer is included? 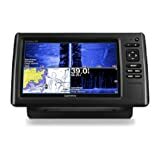 So overall from this Garmin echomap 53dv review, you will find the Garmin echoMAP 53dv quite great for a small GPS and fish finder combo unit. As it has LakeVü charts, and a 77/200 transducer, it’s pretty obvious that this is only for freshwater use. However, other than some drawbacks, the device manages to impress us well with some great features and functions. So you do actually get what you pay for. Moreover, we hope that this Garmin echomap 53dv review helps you decide to take it or leave it.